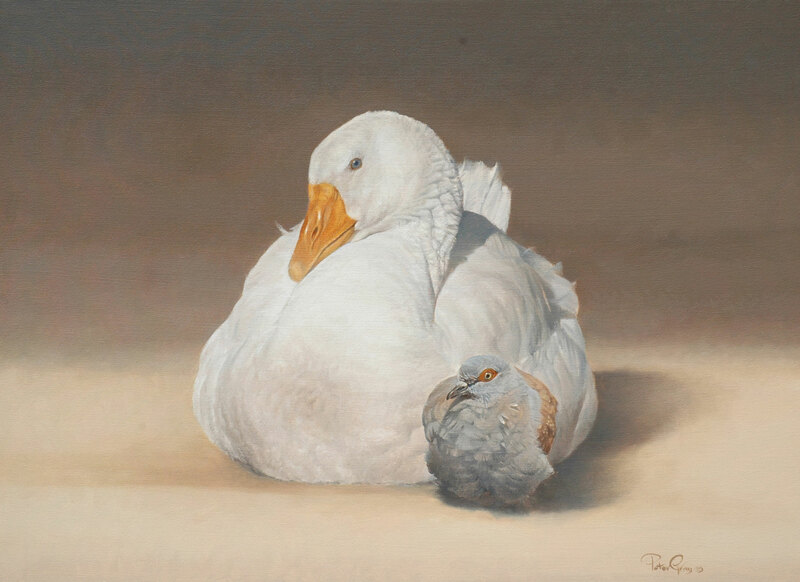 This piece is part of a series of geese that I did when we lived on Lake Michelle in Noordhoek, Cape Town. The body of work gave me an opportunity to explore textures, light, and volume. I don’t know what I enjoy the most here – the process of applying paint and the subsequent technical discovery is certainly the core of my stimulation, but a white goose performing in perfect light is an inspirational sight. Wild, white geese, rock pigeons and a number of other birds would sit on our front lawn and rest together. It was a nice alliance that they seemed to have. The geese used to come each day, around 4pm and do a little display for us – swimming, preening and sunbathing. They made ideal subjects for me. White geese particularly, are stunning in the sunshine. I love the contrast created – brilliant, white feathers casting deep shadows across their bodies.